Tissue, cells or virus corresponding to Cow COX IV. Human, bovine, murine and rat heart mitochondria. This antibody makes an effective loading control for mitochondria. COXIV is generally expressed at a consistent high level. However, be aware that many proteins run at the same 16kD size as COXIV - our VDAC1 / Porin antibody makes a good alternative mitochondrial loading control for proteins of this size. Some caution is required when using this antibody as a loading control as COXIV expression can vary under some manipulations. 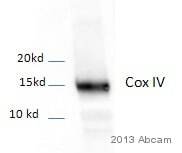 An alternative mitochondrial loading control is Rabbit polyclonal to COX IV antibody (ab16056). Our Abpromise guarantee covers the use of ab14744 in the following tested applications. WB Use a concentration of 1 µg/ml. Detects a band of approximately 17 kDa. ab14744 at 1/100 staining MCF-10A cells (human mammary epithelial cell line) by ICC/IF. The cells were methanol/acetone fixed at -20C for 5 minutes, blocked with BSA and then incubated with the antibody for 16 hours. The positive tissue was colocalised with a mitotracker (mitotrackers are a series of patented mt-selective stains that are concentrated by active mt and well retained during cell fixation). 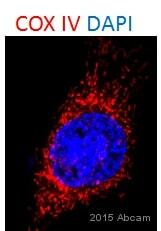 An Alexa-Fluor ® 488 conjugated goat anti-mouse antibody was used as the secondary. The image shows COXIV staining in green and DAPI staining in blue. Overlay histogram showing HeLa cells stained with ab14744 (red line). The cells were fixed with 80% methanol (5 min) and then permeabilized with 0.1% PBS-Tween for 20 min. The cells were then incubated in 1x PBS / 10% normal goat serum / 0.3M glycine to block non-specific protein-protein interactions followed by the antibody (ab14744, 0.5µg/1x106 cells) for 30 min at 22°C. The secondary antibody used was DyLight® 488 goat anti-mouse IgG (H+L) (ab96879) at 1/500 dilution for 30 min at 22°C. 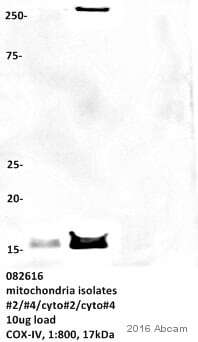 Isotype control antibody (black line) was mouse IgG1 [ICIGG1](ab91353, 2µg/1x106 cells) used under the same conditions. Acquisition of >5,000 events was performed. This image is courtesy of an Abreview submitted by Camilla Skjerpen on 4 July 2005.
ab14744 staining COX IV in rat brain tissue sections by Immunohistochemistry (PFA perfusion fixed frozen sections). Rats were anesthetized and intracardially perfused with 500 ml of normal saline at room temperature, followed by 500 ml of ice-cold, freshly made 4% paraformaldehyde in phosphate buffer (PB, 0.1 M, pH 7.4). A Cy3 conjugated anti mouse antibody was used as secondary. Observed band size: 16 kDa why is the actual band size different from the predicted? Ich freue mich Ihnen bestätigen zu können, dass die Klone dieselben sind und früher bei MitoScience nur abgekürzt wurden. Ich kann Ihnen auch bestätigen, dass eine Lagerung bei -20C korrekt ist solange die Antikörper lyophilisiert sind. Bitte lagern sie die Antikörper bei +4C nach Rekonstitution.